Dr. Meera completed her MBBS from Government Medical College, Kota in 2002 and Masters in Ophthalmology from RNT Medical College, Udaipur in 2007. She worked in NMC Specialty and Dubai Hospitals under the guidance of super specialists in the year 2009 & 2010 and then went on to acquire Phaco fellowship from prestigious Sankar Netralaya, Chennai, India in 2011. She also worked for a short span as associate surgeon in the Sankar Netralaya ,Rameshwaram. 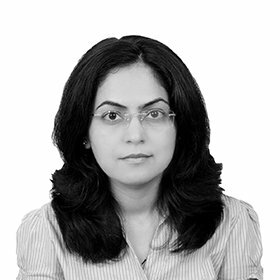 Dr. Meera has been working as Specialist Ophthalmologist with Al Noor Polyclinic, Satwa since October 2012. Her special field of interest is Diabetes and its eye manifestations, and refractive errors in children. She takes pride in her patient listening and kind approach of the whole clinic towards each and every sick person.